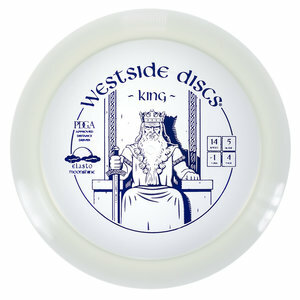 Our most popular high speed driver, the Westside King is our fastest disc for all levels of players. The farthest flying disc in our line the King is designed to allow the average player to experience a long distance flight. It has a good grip and a nice high dome. It traps the air and rides on it like you have never seen before. For professional players the King will be your longest flying disc and roller in your bag. For lower speed arms this will finally give you that full flight you always wanted on the course.